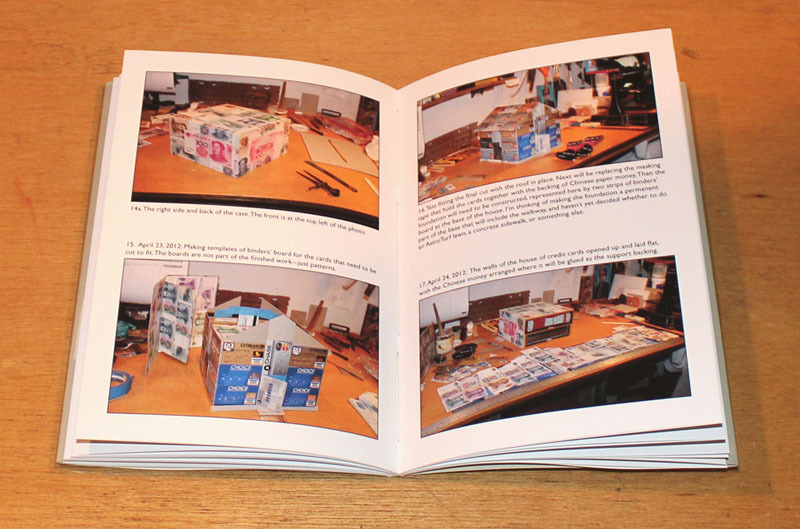 The story of the concept and creation of the book shrine Pop Delusions: A House of Cards. 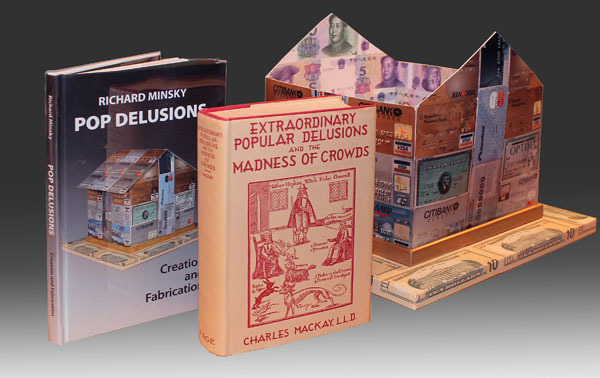 Inside the shrine is the 1852 edition of Charles Mackay's classic work, Memoirs of Extraordinary Popular Delusions and the Madness of Crowds, in the original binding by Burn of Hatton Garden, and a 1963 printing of the 1932 L.C. 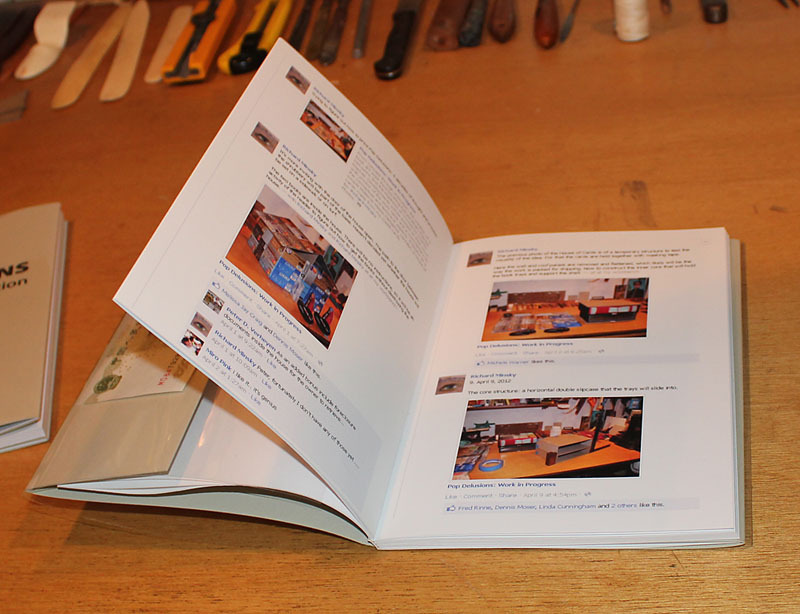 Page edition with an introduction by Bernard Baruch, bound in Minsky's credit cards.This work from start to finish was presented on facebook as a series of updates while the construction evolved. Screen shots of these posts, which took place from March 1 through May 1, 2012, are presented along with full color images printed from the original photo files. 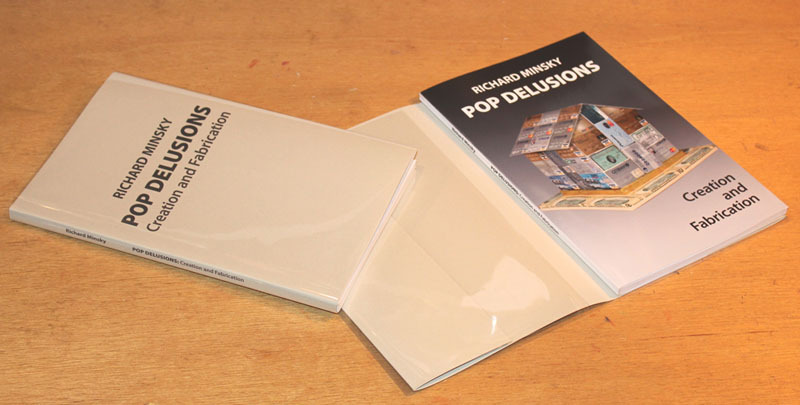 Three formats and a poster are available. All copies are signed and numbered. 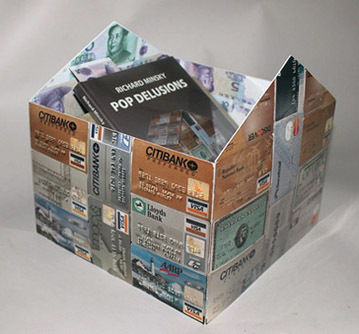 The HARDCOVER Edition of 25 copies with pigment printed cloth cover and archival polyester dust jacket includes a "House of Credit Cards" enclosure. A piece of genuine Chinese paper money is included as a bookmark. 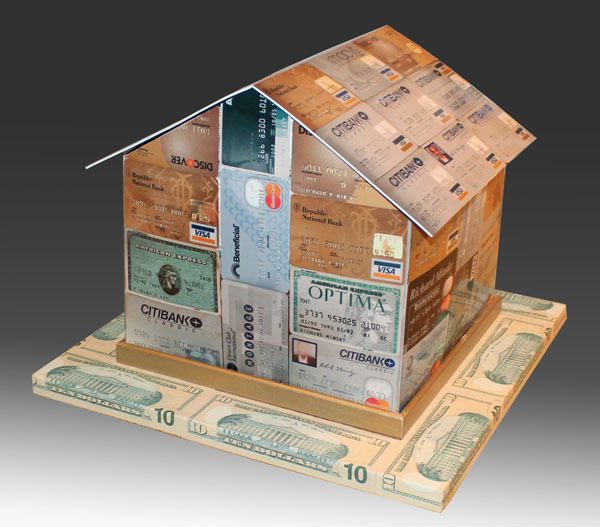 The enclosure is a 9"x9"x9" assembly pigment printed from photographs by Minsky of the original Pop Delusions House of Credit Cards, backed with a pigment print of Chinese money from a collage created for this edition on a scanner bed. 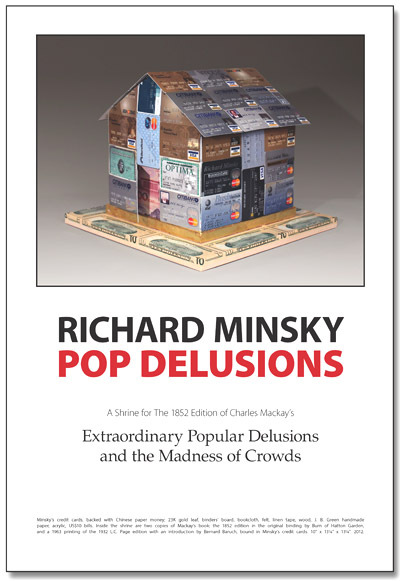 The DELUXE Edition of 5 copies is hardcover, with a printed fold-out "House of Cards" enclosure as above, and incorporates one of Minsky's actual credit cards. 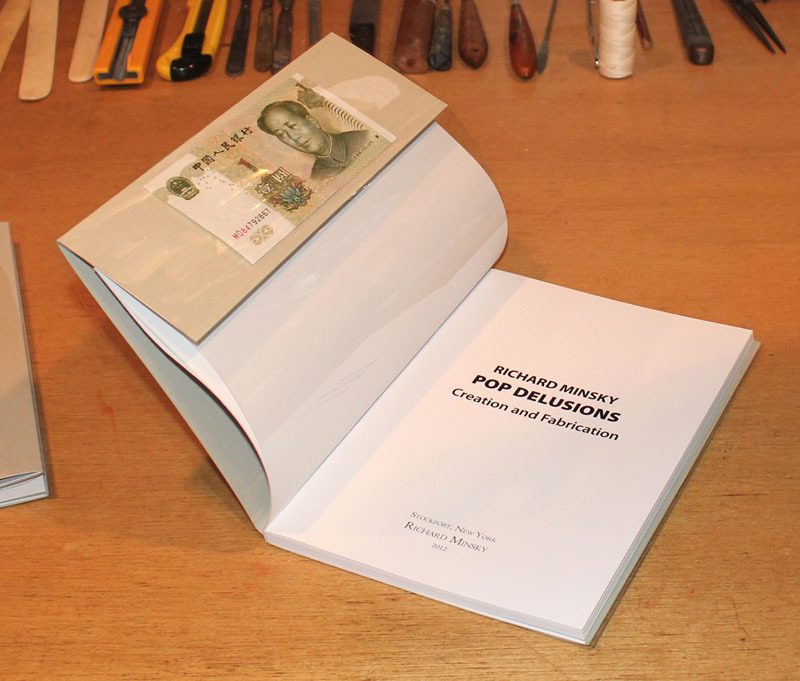 A (used, reprint) copy of the 1932 edition of Mackay's Extraordinary Popular Delusions and the Madness of Crowds is included, with a piece of Chinese paper money as a bookmark. It fits within the enclosure, which has a base. 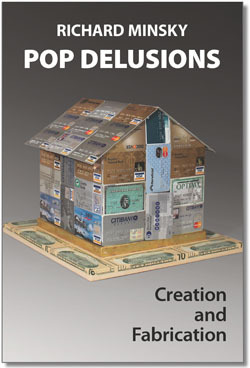 The POSTER Edition of 100 copies is 13" x 19" with an 11" wide photo of Pop Delusions printed in high resolution archival pigment inkjet, with the title and descriptive text. Signed and numbered. To pay by mail with a check or submit an institutional purchase order, please reserve your books or posters online with the order form below, or by phone. If you prefer to use a credit or debit card, you can pay online using the secure ordering system by clicking on "add to cart" above for the items you choose. Or you can call with credit card information. 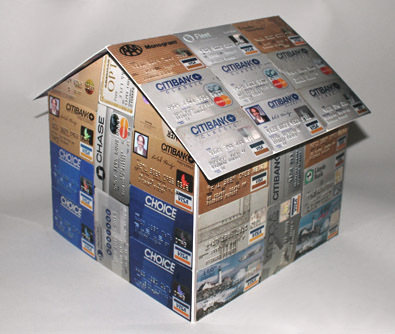 Do not enter credit card information on the form below. Please read the Terms. When filling out this form please check your entries for accuracy, particularly your e-mail address. Additional contact information should be entered in the message box..